LET YOUR BUSINESS GET THE ATTENTION IT DESERVES WITH A CUSTOM MADE SANDBLASTED OR ROUTED SIGN. Capitol Design has been in business for over 40 years and offers world-class sandblasted & routed signs. A sign represents your image. Image is everything in business. Although sandblasted signs are more expensive than ‘quick sign’ vinyl sticker style sign solutions, a sandblasted sign will last for decades. Who Buys our Custom Sandblasted Signs ? We sell to independent & franchised sign companies all over the United States and abroad. One of the most important elements of a business is to advertise who they are and what they do. Builders & Contractors are one of our most valuable customers that represent the end-user clients. Companies that are selling our signs to the end users. Our most Popular Substrates are HDU sign Foam (High Density Urethane) is perfect for indoor signs or out signs. It is manufactured to endure the elements and is 100% waterproof! Adding a 3rd dimension to your sign enhances the look and beauty to your logo or the fonts. 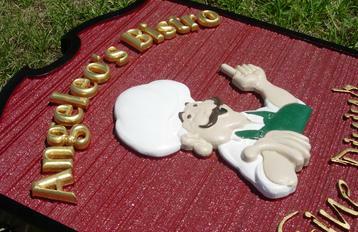 Consider making your sandblasted or routed sign more appealing to your customers by using our 3 D Effects. Our Cedar Sandblasted Signs can be sandblasted or routed into a elegant quality sign that will last for decades. King ColorCore® is an innovative new sign material manufactured with layers of brilliantly contrasting colors within the polymer. It can be routed to your specifications and is durable for years against the elements. Just A Few of the Reasons Why You’ll Call CAPITOL DESIGN Again and Again! We are one of the largest and most experienced manufactures of sandblasted signage in the United States. While we are located in the Southeast, our client list spans all 50 states. The main reason demand of our product is we focus on quality and personalized service. Our design department at Capitol Design is experienced and always available to give creative input that results in outstanding results. Capitol Design realized years ago that even the most meticulously crafted sign is worthless unless the best materials are used. We use the best kiln-dried clear-heart cedar & redwood lumber and the best quality High Density Urethane in the industry. Capitol Design employees some of the finest professional and artistic painters available. From simple lettering to detailed lifelike scenes and wildlife, our painters and artists can handle the job. Our artwork is so lifelike, don’t be surprised if a bumblebee tries to get pollen from one of our painted flowers. Capitol Design always strives to produce the perfect sign. But if unique circumstances result in a flaw, we’re always available to correct the problem. Often times it is easy to take for granted all the hard work that goes on behind the scenes, and I just wanted to make sure to stop and say thank you for all that you do in support of myself and HOA Signs! This would not have been possible without your expertise, help, and support and the valuable relationship we have with your company! Signs just showed up. They look great. You guys did a fantastic job on it. Thank you and your team. I’ll have more to send your way soon. Got the sign today and it looks fantastic! I always forget how much I love sandblasted signs until I get to do one. John K., Talley Anchor Sign Co. The sign you made looks really good, so I wanted to share. Thanks for the good work! Just wanted to drop you a note to thank you for the excellent job on the HDU signs. They looked great! I’m very glad to know of a source for this type of sign at the level of quality you guys provided. I hope to do more jobs together in the future. Compliments keep coming in for the Sytsma Wealth sign. Well done! Mission accomplished today, just in time for the opening – thanks for the great looking HDU unit! Thanks so much for all your help. You’ve made this process super easy!